Yesterday was April 15th, "Tax Day", the day we all dutifully submit our tax forms to the state and U.S. government authorities, pay what is due or wait anxiously for a return of what we overpaid. Matthew 22:17-21, the Pharisees asked Jesus a question: "Tell us then, what is your opinion? Is it right to pay taxes to Caesar or not?" But Jesus, knowing their evil intent, said, "You hypocrites, why are you trying to trap me? Show me the coin used for paying the tax." They brought Him a denarius, and He asked them, "Whose portrait is this? And whose inscription?" "Caesar's," they replied. Then He said to them, "Give to Caesar what is Caesar's, and to God what is God's." In full agreement, the Apostle Paul taught, "This is also why you pay taxes, for the authorities are God's servants, who give their full time to governing. Give everyone what you owe him: If you owe taxes, pay taxes; if revenue, then revenue; if respect, then respect; if honor, then honor" (Romans 13:6-7). Last Sunday, we celebrated Mission Sunday with a Special Sermon & Response with Kate Duggan, Executive Director - Family Promise of Bergen County. Sermon: Matthew 9:9-13 "Family Promise"
How are these related? 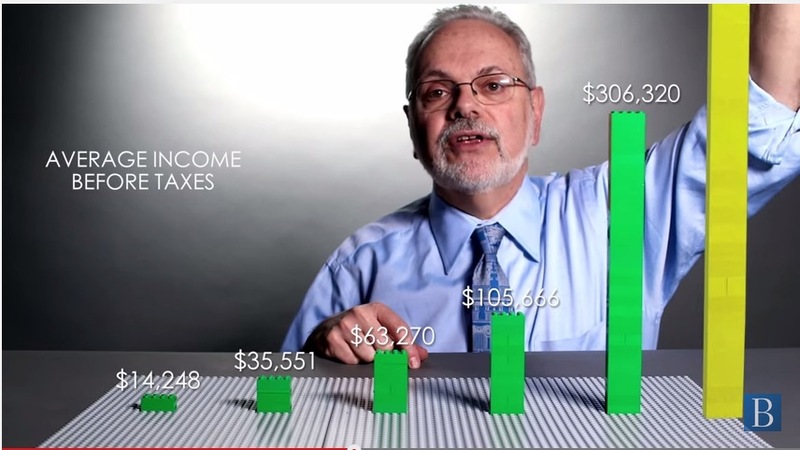 Well, here are two videos from the Brookings Institute* that will help explain the wage gap in the US, how our taxes effect income inequality, and understanding social mobility - the ability of a person born in poverty to succeed in becoming wealthy. What are your thoughts? Is it unjust to have such a large wage gap (we didn't see the true gap because of the size of the top 1% yellow lego stack was too large for the viewscreen)? If a wage gap is expected and just, then is it just that most people born into poverty will remain in poverty? Would it be just to have more fluid movement up-and-down the social groupings? What would Jesus say? People often reference Mark 14:7 "The poor you will always have with you, and you can help them any time you want. But you will not always have me." Do you believe that Jesus was advocating for a never-ending poverty segment? I am interested in learning what our congregation thinks about this topic. * The Brookings Institution is a nonprofit public policy organization based in Washington, DC. Our mission is to conduct high-quality, independent research and, based on that research, to provide innovative, practical recommendations that advance three broad goals: Strengthen American democracy; Foster the economic and social welfare, security and opportunity of all Americans and Secure a more open, safe, prosperous and cooperative international system.